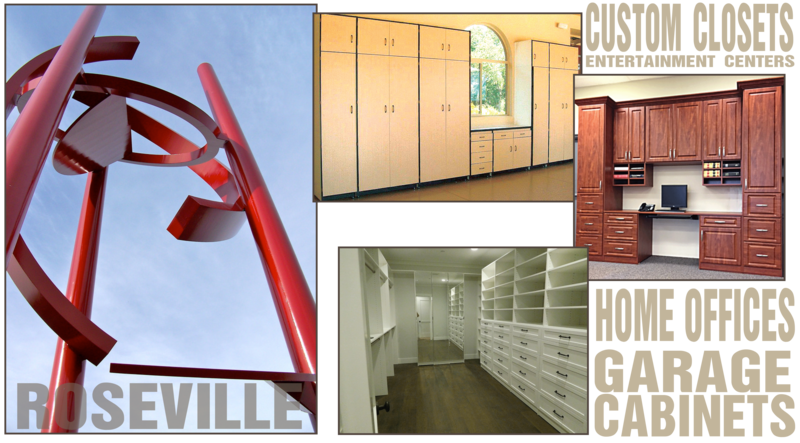 Roseville, California - Alpine Cabinet Company "
Custom design for your storage and organizational needs is our specialty in Roseville. Whether you need garage cabinets, a custom closet, a home office, or a beautiful entertainment center, you will find it at Alpine Cabinet Company. Alpine pioneered the garage cabinet industry when we established our locally owned shop in 1984. With the support of Roseville customers, we have grown our shop into a 25,000 square foot manufacturing plant where we custom make all of our cabinets. Organization and storage are two of the most challenging issues that homeowners face. Alpine Cabinet Company offers the best in the business with our customized garage cabinets, fully custom built closets, home office, and entertainment centers. Alpine’s innovative design, professional installation, and practical storage solutions make your decision easy. A unique bracket created for your safety ensures your garage cabinets are strong and extremely stable so your tools and storage needs are secured. Organize your walk-in or reach-in closet for maximum efficiency. Make your home office work for you whether you want a dedicated office space or a space to pay bills. Choose your storage and display options with entertainment centers designed for your enjoyment. Customize your lighting, accessories, finishes, and high-quality garage floor coating to enhance your home environment. Contact us to provide your storage and organizational solutions. Also serving communities around Roseville such as Rocklin, Citrus Heights, Auburn, Lincoln, and all the way to Truckee.